1. 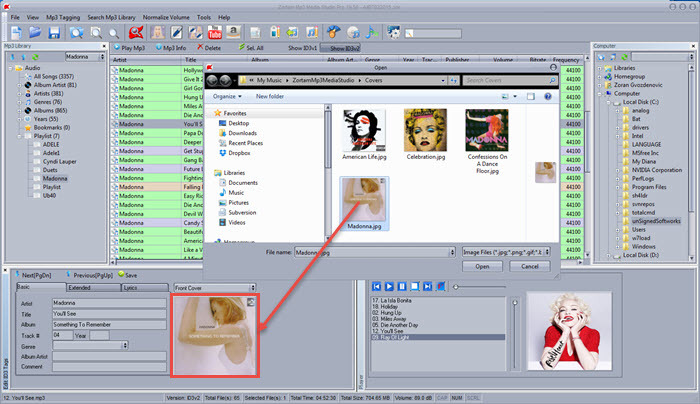 By Filename – searching is done using filename attributes file size and using the name of the file. If file size and name of the file are matched we assume that file is duplicate. 2. By Artist and title tags – searching is done using artist and title from ID3 tags. If artist and title tags are matched file is assumed to be duplicate. After duplicated files are found they are preselected in dialog. You can remove them from Mp3 Library or delete them physically from hard drive. This entry was posted in How To and tagged Add cover art to Mp3, Add cover art to songs, Add lyrics to Mp3, Advanced mp3 editor, Auto tag Mp3 and Mp3 Tag Editor and Organizer, Auto tag mp3 files, Batch ada cover art to mp3, Batch add album art to mp3, CD Ripper, Create and manage playlist, Edit Mp3 tags, Fix mp3 tags automatically, Id3 Tag Editor, Import playlist form iTunes, Normalize mp3, Organize mp3 files, Remove cover art from mp3, Remove ID3 Tags, Remove tags from Mp3, Rename files mp3 tags, Search for cover art, Search for lyrics, Wav converter, Write tags from filename on July 31, 2015 by Zortam Support. This entry was posted in How To and tagged add album art, add album art to mp3, add cover art, Add cover art to Mp3, Add cover art to songs, Add lyrics to Mp3, Advanced mp3 editor, Auto tag Mp3 and Mp3 Tag Editor and Organizer, Auto tag mp3 files, Batch ada cover art to mp3, Batch add album art to mp3, CD Ripper, Create and manage playlist, Edit Mp3 tags, Fix mp3 tags automatically, Id3 Tag Editor, Import playlist form iTunes, Normalize mp3, Organize mp3 files, Remove cover art from mp3, Remove ID3 Tags, Remove tags from Mp3, Rename files mp3 tags, Search for cover art, Search for lyrics, Wav converter, Write tags from filename on July 27, 2015 by Zortam Support. Default volume for normalization is 89.0 dB. You can see it on status line. You can change it to another values then 89.0 dB at Options-Normalization-Target Volume. 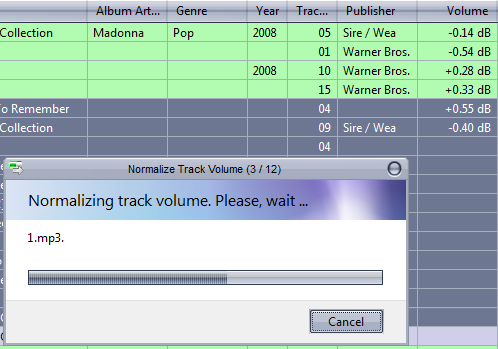 It is always good to make undo track volume, before going with another target volume if files are already normalized. Zortam is using mp3gain (http://mp3gain.sourceforge.net/faq.php) for normalization process. This entry was posted in How To and tagged Add cover art to Mp3, Add cover art to songs, Add lyrics to Mp3, Advanced mp3 editor, Auto tag Mp3 and Mp3 Tag Editor and Organizer, Auto tag mp3 files, Batch ada cover art to mp3, Batch add album art to mp3, CD Ripper, Create and manage playlist, Edit Mp3 tags, Fix mp3 tags automatically, How to normalize file to a specific volume, Id3 Tag Editor, Import playlist form iTunes, Normalize mp3, Organize mp3 files, Remove cover art from mp3, Remove ID3 Tags, Remove tags from Mp3, Rename files mp3 tags, Search for cover art, Search for lyrics, Wav converter, Write tags from filename on December 22, 2014 by Zortam Support. 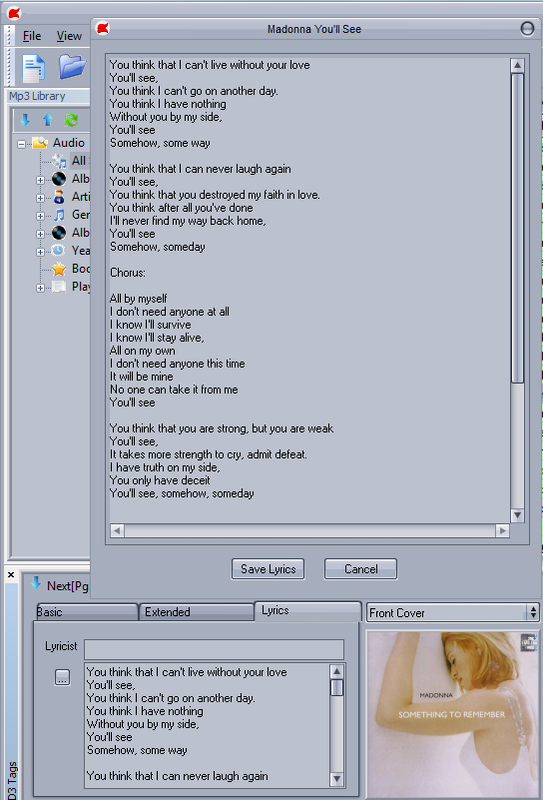 You can add lyrics by yourself or it can be downloaded from the Zortam database. Lyrics is saved within ID3v2 tag so it can be viewed on any device including your mobile phone and/or any Mp3 player that supports ID3 tags (there is a lot of them). using Zortam Music database and update lyrics ID3 Tag. [Tools] – [Send To Lyrics And Cover Art Finder] – Shortcut Key [Alt+F3]. Program will search for lyrics using Zortam Music database and update lyrics ID3 Tag. This entry was posted in How To and tagged Add cover art to Mp3, Add cover art to songs, Add lyrics to Mp3, Advanced mp3 editor, Auto tag Mp3 and Mp3 Tag Editor and Organizer, Auto tag mp3 files, Batch ada cover art to mp3, Batch add album art to mp3, CD Ripper, Create and manage playlist, Edit Mp3 tags, Fix mp3 tags automatically, How to add lyrics to mp3, Id3 Tag Editor, Import playlist form iTunes, Normalize mp3, Organize mp3 files, Remove cover art from mp3, Remove ID3 Tags, Remove tags from Mp3, Rename files mp3 tags, Search for cover art, Search for lyrics, Wav converter, Write tags from filename on December 22, 2014 by Zortam Support. 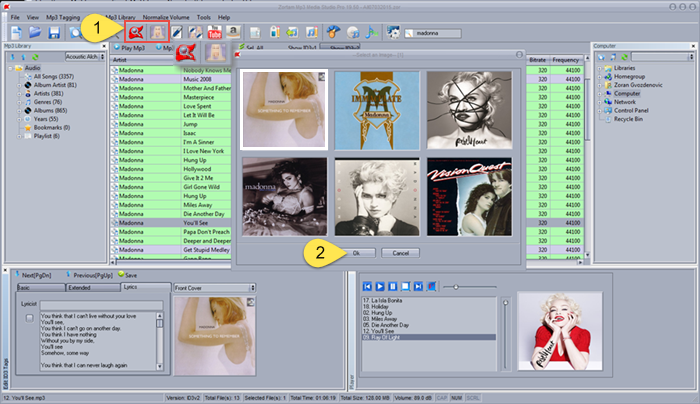 This entry was posted in How To and tagged Add cover art to Mp3, Add cover art to songs, Add lyrics to Mp3, Advanced mp3 editor, Auto tag Mp3 and Mp3 Tag Editor and Organizer, Auto tag mp3 files, Batch ada cover art to mp3, Batch add album art to mp3, CD Ripper, Create and manage playlist, Edit Mp3 tags, Fix mp3 tags automatically, Id3 Tag Editor, Import playlist form iTunes, Normalize mp3, Organize mp3 files, Remove cover art from mp3, Remove ID3 Tags, Remove tags from Mp3, Rename files mp3 tags, Search for cover art, Search for lyrics, Wav converter, Write tags from filename, Zortam YouTube on December 22, 2014 by Zortam Support.